Manchester City’s unflinching attitude and proven game-changers were the crucial factors in their 1-2 win against Watford at Vicarage Road on Saturday. City went into this fixture on the back of a six-game win-less run away from the Etihad, and six points behind leaders Arsenal, who had won against Newcastle United earlier in the day. Manuel Pellegrini’s men were nowhere near their dynamic self, as Watford stifled the visitors to very few chances throughout the game and, going forward, posed a greater threat than their illustrious opponents. Ben Watson’s crafty corner-kicks always had Joe Hart and City worried, and the goal scored by the home side was single-handedly created by the former Wigan Athletic man, after Odion Ighalo forced the erratic Eliaquim Mangala to concede a corner. Going into the last ten minutes, City were 1-0 down, but were firmly knocking on Watford’s door. Yaya Toure made a little dart into the box while Aleksandar Kolarov was about to take the corner. The Ivorian was unmarked, and from a decent delivery side-footed a sweet volley into the top right-hand corner. It brought City level with eight minutes of the 90′ still to be played. The visitors then managed to find another gear to their attacking play, as they pushed for all three points. The game-clincher came from Watford’s left, where Jesus Navas and Bacary Sagna dovetailed beautifully to conjure up an opening. Sagna made an overlapping run on the outside, with Navas playing a nicely-weighted pass for the French fullback to whip it in first time. Sagna delivered a delicious out-swinging cross to pick out a leaping Sergio Aguero who tucked it in the bottom left-hand corner with his head, giving Heurelho Gomes absolutely no chance. City’s players and supporters went absolutely ballistic. With this victory, City moved to 39 points, one behind Leicester City and three behind the Gunners. 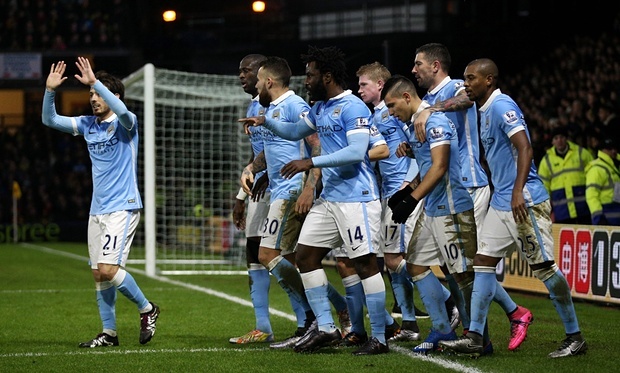 What are the three key takeaways for City, in Saturday’s victory? Along with Fernandinho and Sagna, City’s Argentine centre-back was another player who stood out against the Hornets. Playing alongside Mangala, who was not decisive enough with his defensive actions, would have been tough for Otamendi, who, however, went about his job superbly. Otamendi must have found Ighalo difficult to handle. There was also a moment in the first half, when the Nigerian striker got past Otamendi seamlessly and forced a save from Joe Hart. The 27-year-old defender redeemed himself thereafter and produced a solid display that saw him win 50% of his tackles (8), same percentage of aerial duels (6), make five interceptions, eight clearances and three blocks. Importantly, he did not commit a foul over 94 minutes, which is a testament to how good he was on the night. Out of the four defenders City have at the moment, Vincent Kompany is out with a calf injury. Mangala, despite the consistent run of games, still lacks the composure and is unreliable, to say the least. Martin Demichelis is in the last few months of his contract, and despite being a good reader of the game, lacks the pace to handle the likes of Ighalo, Jamie Vardy and Romelu Lukaku. Otamendi’s form, therefore, is immensely critical to City’s 2015-16 campaign. Pellegrini and Txiki Begiristain can afford to be delighted with their decision to bring Otamendi from Valencia last summer. City may have brought an end to their win-less away run only on Saturday, against Watford, but performance wise, they were not bad either, against Arsenal and Leicester City. Following the 2-0 defeat against Stoke City, Pellegrini’s side has picked itself up and played well away from home. At the Emirates Stadium, City dominated possession for the first 30 minutes of the game and looked the more confident of the two sides. Not only that, they carved out a handful of openings, and Kevin de Bruyne went close to breaching Petr Cech in the first half. Of course, you need to score goals to win football matches, but City were clearly dominant at various stages during the game. That, for me, has been a massive improvement from the no-show against the Potters. Against the Foxes last week, City dominated possession and went close to scoring on a couple of occasions, through Raheem Sterling. The problem for City, away from home, has been the lack of precision in front of goal. They, actually, have done well to play the way they have. Their failure to score goals has what cost them dearly. With Sergio Aguero back from injury, City have a striker who will take most of the chances that come his way. Meaning, City do not have to carve out a lot of openings, presumably, to find the back of the net. And that does bode well for them in the games coming up. The victory against Watford is realisation of the fact that the Cityzens’ away form is getting better and better, with each passing game. Away games in the Capital One Cup and FA Cup, against Everton and Norwich City, can only be of help to City, who ‘have to’ produce good results away from home to make this a successful a season. How does Pellegrini strike the right balance to his lineup? Saturday’s lineup against Watford is probably the best City’s Chilean manager can put out. Add Kompany to the rearguard, and City will only become a stronger and more solid outfit than they are already. The problem, however, is, they are not a balanced outfit. And it showed against Watford. When Sterling, de Bruyne and David Silva are fit and start behind the No.9, Toure has to play alongside Fernandinho in the middle of midfield. At least two of the aforementioned quintet are defensively liable. Sterling, to be fair to him, does track back and helps out Kolarov more often than not. De Bruyne has done it in a few games, and was a defensive live wire against Sunderland. The same, however, cannot be said of Silva and Toure. And from the opposition’s point-of-view, there is plenty of scope for unsettling that City midfield. Bundles of energy and players with technical ability are all that you, as an opposition manager, need, to boss the midfield when playing against City. Pellegrini has got to do something about it. Navas would be the obvious choice, to come in place of Sterling and de Bruyne. That would still leave Silva and Toure in the centre of the park. And teams are increasingly taking note of this susceptibility in City’s arsenal and, more often than not, making them pay for their lackadaisical midfield displays. The aforementioned takeaways are critical to City’s season as a whole. Sagna returned to his early season’s form, after enduring a tough month or so; Fernandinho played ‘the starring role’ in City’s win against Watford, and Otamendi shone at centre-back too. Aguero scoring a goal in only his third start after recovering from the injury does bode well for the Cityzens.